Never Before Under One Roof and in One Kitchen! The Leading Chefs of the World Create and Collaborate. Chefs Massimo Bottura, Mauro Colagreco, Joan Roca, and Christina Tosi. The Once Upon A Kitchen experience is an elite event. The caliber of chefs, guests and venue all speak to an extraordinary level of engagement. We are offering only a few sponsorship opportunities to the brands, products and service that speak to the sensibilities of our guests and stakeholders. Like this experience, our sponsorships are individually crafted with great care. We welcome inquiries from companies who are already in markets that serve the most successful and influential national and international audiences. We offer a wide array of pre, during and post event engagement at the event and through our digital and social assets, including custom behind the scenes access. Please contact me through the form below so that we may initiate a dialog regarding how to help you engage our audience with proven strategies and tactics that will engage our elite audience. In a stunning landmark location in New York, our guests will have a once in a lifetime opportunity to meet and experience four chefs at the top of their industry. In addition, the event will be presided over by a renowned winemaker as well as epicurean insiders for a spectacular evening. Chefs Bottura, Roca, and Colagreco are currently sitting at number 2, 3 and 4 in the ranking of The World’s 50 Best. Being able to taste any of these chefs’ dishes would normally require a trip to Italy, France or Spain and never could one have the privilege of tasting all of these chefs’ magnificent creations and dishes under one roof. To cap off the evening, the creative mastermind and classically trained pastry chef Christina Tosi, Founder, and CEO of Milk Bar, will create an innovative and whimsical dessert, specifically for the event. 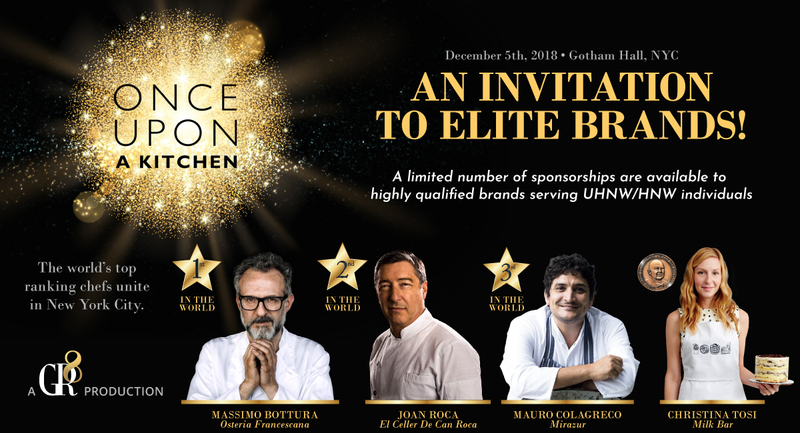 For the first time ever, these four culinary masters will create together an exceptional multi-course gastronomic dinner featuring their signature dishes from their respective properties: Osteria Francescana, El Celler de Can Roca, Mirazur and Milkbar. The culmination of this epic evening will be a surprise collaborative dish. We are convinced this culinary creation will be talked about for years to come and viewed as a historic epicurean milestone!